Forest Lawn Memorial Park is a privately owned cemetery in Glendale, California, US. It is the original and current flagship location of Forest Lawn Memorial-Parks & Mortuaries, a chain of six cemeteries and four additional mortuaries in Southern California. Forest Lawn Memorial Park was founded in 1906 as a not-for-profit cemetery by a group of businessmen from San Francisco. 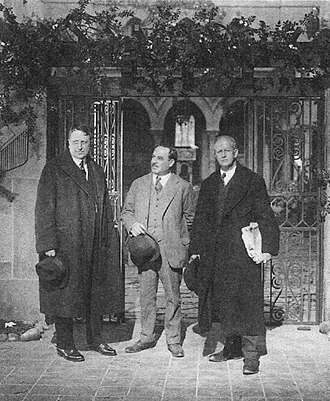 Dr. Hubert Eaton and C. B. Sims entered into a sales contract with the cemetery in 1912. Eaton took over the management of the cemetery in 1917. Although Eaton did not start Forest Lawn Cemetery, he is credited as being the "Founder" of Forest Lawn Memorial-Park for his innovations of establishing the "memorial park plan" (eliminating upright grave markers and bringing in works by established artists) and being the first to open a funeral home on dedicated cemetery grounds. Eaton was a firm believer in a joyous life after death. He was convinced that most cemeteries were "unsightly, depressing stoneyards" and pledged to create one that would reflect his optimistic, Christian beliefs, "as unlike other cemeteries as sunshine is unlike darkness." 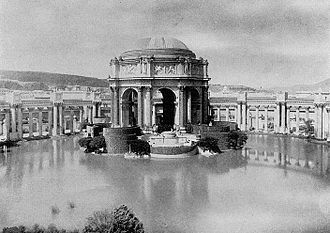 He envisioned Forest Lawn to be "a great park devoid of misshapen monuments and other signs of earthly death, but filled with towering trees, sweeping lawns, splashing fountains, beautiful statuary, and ... memorial architecture." A number of plaques which state Eaton's intentions are signed "The Builder." Frederick Llewellyn, Eaton's nephew, became CEO of Forest Lawn in 1966. In 1987 he was succeeded by his son, John Llewellyn, who is the current Chairman of Forest Lawn. Most of its burial sections have evocative names, including Eventide, Babyland (for infants, shaped like a heart), Graceland, Inspiration Slope, Slumberland (for children and adolescents), Sweet Memories, Whispering Pines, Vesperland, Borderland (on the edge of the cemetery), and Dawn of Tomorrow. The original Forest Lawn participated in racial segregation and "for decades refused entrance to blacks, Jews, and Chinese". Song of the Angels by William Bouguereau, 1881. The Forest Lawn Museum in Glendale was founded in 1957 and displays art, artifacts and also regularly hosts rotating fine art exhibits. 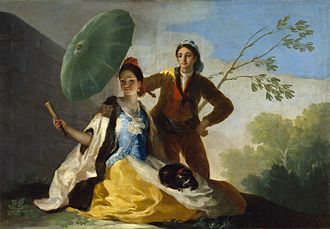 The museum has hosted solo exhibitions for Henri Matisse, Winslow Homer, Ian Hornak, Francisco Goya, Rembrandt, Marc Davis and Reuben Nakian among many others. The objects in Forest Lawn's permanent collection represent specific locations and peoples from around the world. 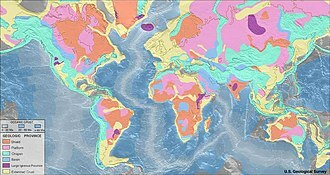 There are sections for India, Africa, the Middle East, East and Southeast Asia, the United States, South America, Australia and Europe. 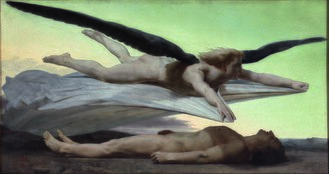 Perhaps the most famous object owned by Forest Lawn's permanent collection is William Bouguereau's 84x60 inch, oil on canvas painting, "Song of the Angels" created in 1881 and regarded as one of the most important examples of Bouguereau's work in the United States. The permanent collection also includes one of the largest and most well respected stained glass collections in North America with over 1000 pieces primarily from France and Germany dating from 1200 A.D. through the present. The stained glass collection includes portions of William Randolph Hearst's former collection and owns the work of Albrecht Dürer and Viet Hirsvogel the Elder. 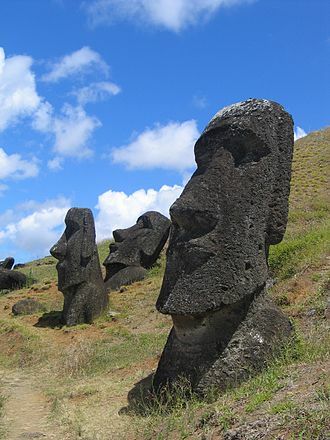 The Museum also houses Western bronze sculptures, Italian marble statues, American historical artifacts, paintings, world cultural artifacts, and one of the Easter Island statues (mo'ai), rescued from the bottom of a boat where it was used as ballast. It is named "Henry". All of these precious art pieces are put in storage or hidden behind temporary walls when a special display is on site. The six Forest Lawn cemeteries contain about 1,500 statues, about 10% of which are reproductions of famous works of art. Leonardo da Vinci's The Last Supper has been recreated in stained glass in the Memorial Court of Honor at the Glendale location ‘in vibrant, glowing and indestructible colors.’ There are also a number of full-sized reproductions of other Renaissance sculptures, including Michelangelo's David and Moses. 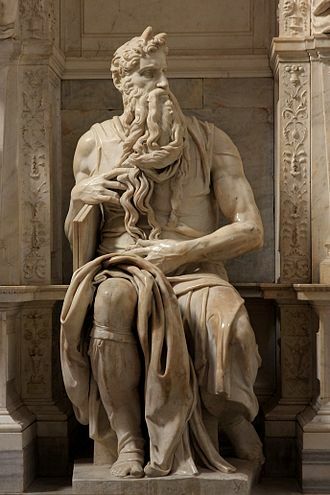 This cemetery is the only place in the world containing a complete collection of replica Michelangelo sculptures, which were made from castings taken from the originals and use marble sourced from the original quarries in Carrara, Italy. Some of the inspiration at Forest Lawn in Glendale is patriotic rather than pious, such as the Court of Freedom, with its large mosaic of John Trumbull's Declaration of Independence and a 13-foot (4.0 m)-tall statue of George Washington. On display in the "Hall of the Crucifixion" is the panoramic painting by the Polish artist Jan Styka entitled "The Crucifixion." It is the largest permanently mounted religious painting in the world, measuring 195 feet (59 m) in length by 45 feet (14 m) in height. The main gates of Forest Lawn – Glendale are claimed to be the world's largest wrought iron gates. Forest Lawn has three non-denominational chapels: "The Little Church of the Flowers", "The Wee Kirk o’ the Heather" and "The Church of the Recessional", which are all exact replicas of famous European churches. Over 60,000 people have actually been married here, including Ronald Reagan and Jane Wyman. More than 250,000 people are buried at Forest Lawn, and over a million people visit it each year, including thousands of schoolchildren on field trips. Forest Lawn's 300 acres (1.2 km2) of intensely landscaped grounds and thematic sculptures were the inspiration for the biting commentary of Evelyn Waugh's satirical novel The Loved One and Jessica Mitford's acerbic The American Way of Death. 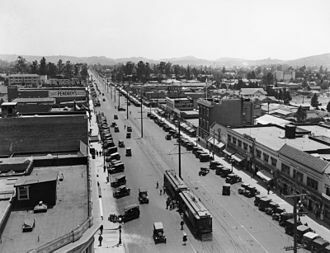 Many commentators have considered Forest Lawn to be a unique American creation, and perhaps a uniquely maudlin Los Angeles creation, with its "Disneyland-type theme park" approach to death. 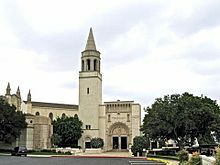 The Great Mausoleum was fashioned after Campo Santo in Genoa, Italy and contains many of the most highly sought after interment places within Forest Lawn, Glendale. Within the portion of the Great Mausoleum accessible to the general public is the Court of Honor where individuals are inducted as "Immortals" by Forest Lawn's Council of Regents. The rest of the structure is protected by cameras and is closed to the public unless they have a "Loved One" interred here. Time magazine described it as the "New World's Westminster Abbey". In 2009 the cemetery became the focus of intense media interest surrounding the private interment of Michael Jackson in the privacy of Holly Terrace in the Great Mausoleum. ^ Llewellyn, John (1998). A Cemetery Should Be Forever, p. xviii. Tropico Books, Glendale. ISBN 0-9665801-2-5. ^ "Matisse creates poetry in motion". tribunedigital-glendalenews-press. Retrieved 2016-03-11. ^ "Winslow Homer Engravings on Display". tribunedigital-glendalenews-press. Retrieved 2016-03-11. ^ Poundstone, William (18 June 2012). "Ian Hornak at Forest Lawn". Blouinartinfo. Retrieved 28 September 2013. ^ "Welcome to the Official Website of the Ian Hornak Foundation". ianhornak.com. Retrieved 2016-03-11. ^ "Art Review: Editorial etchings". tribunedigital-burbankleader. Retrieved 2016-03-11. ^ "Hitting the Marc". tribunedigital-glendalenews-press. Retrieved 2016-03-11. ^ "Around Town". Glendale News-Press. 14 August 2009. Retrieved 28 September 2013. ^ "Entrance Gates (Forest Lawn)". forestlawn.com. Retrieved 2016-03-11. ^ "In a Private Service, Last Goodbyes for Jackson". The New York Times. September 3, 2009. ^ "Michael Jackson tomb remains a mystery". The Associated Press. September 4, 2009. ^ "Michael Jackson - No one is forgetting". TMZ. November 8, 2009. ^ "Michael Jackson's Family Drops Extra Security At His Tomb". Radar Online. March 29, 2010. Wikimedia Commons has media related to Forest Lawn Memorial Park, Glendale. Evelyn Waugh's witty essay, Half in love with easeful death, imagines archaeologists in 1000 years coming upon Forest Lawn. 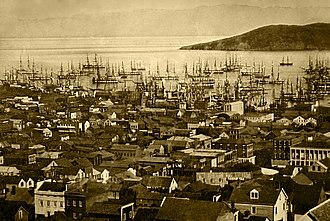 Hearst entered the publishing business in 1887 after being given control of The San Francisco Examiner by his wealthy father. Acquiring more newspapers, Hearst created a chain that numbered nearly 30 papers in major American cities at its peak and he expanded to magazines, creating the largest newspaper and magazine business in the world. Politically he espoused the Progressive Movement, speaking on behalf of the working class and he controlled the editorial positions and coverage of political news in all his papers and magazines and thereby exercised enormous political influence. He called for war in 1898 against Spain—as did many other newspaper editors—but he did it in sensational fashion, after 1918, he called for an isolationist foreign policy to avoid any more entanglement in what he regarded as corrupt European affairs. He was at once a militant nationalist, a fierce anti-communist, and deeply suspicious of the League of Nations and of the British, French and Russians. He was a supporter of Franklin Roosevelt in 1932–34, but broke with FDR. His life story was the inspiration for Charles Foster Kane. His famous mansion, Hearst Castle, on a hill overlooking the Pacific Ocean near San Simeon, is now a State Historical Monument and a National Historic Landmark. William R. Hearst was born in San Francisco, to mining engineer, goldmine owner and U. S. senator George Hearst. His paternal great-grandfather was John Hearst, of Ulster Protestant origin and he migrated to America from Ballybay, County Monaghan as part of the Cahans Exodus with his wife and six children in 1766 and settled in South Carolina. 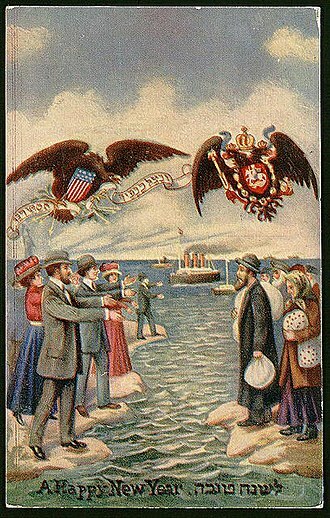 Their immigration to South Carolina was spurred in part by the governments policy that encouraged the immigration of Irish Protestants. The names John Hearse and John Hearse Jr, the Hearse spelling of the family name never was used afterward by the family members themselves, or any family of any size. 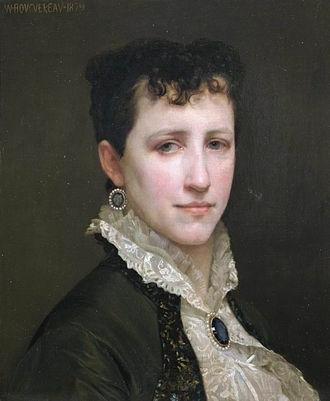 Hearsts mother, née Phoebe Elizabeth Apperson, was of Irish ancestry and she was the first woman regent of University of California, funded many anthropological expeditions and founded the Phoebe A.
Winslow Homer was an American landscape painter and printmaker, best known for his marine subjects. He is considered one of the foremost painters in 19th-century America, largely self-taught, Homer began his career working as a commercial illustrator. He subsequently took up oil painting and produced major studio works characterized by the weight and he worked extensively in watercolor, creating a fluid and prolific oeuvre, primarily chronicling his working vacations. Born in Boston, Massachusetts in 1836, Homer was the second of three sons of Charles Savage Homer and Henrietta Benson Homer, both from long lines of New Englanders and his mother was a gifted amateur watercolorist and Homers first teacher. 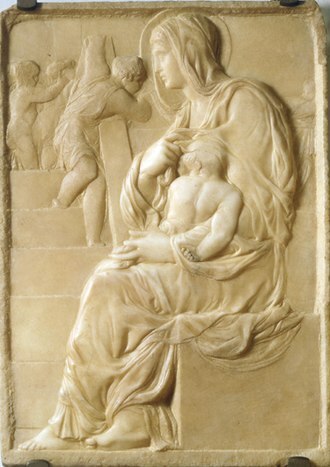 She and her son had a relationship throughout their lives. Homer took on many of her traits, including her quiet, strong-willed, sociable nature, her dry sense of humor, Homer had a happy childhood, growing up mostly in rural Cambridge, Massachusetts. He was a student, but his art talent was evident in his early years. Homers father was a volatile, restless businessman who was looking to make a killing. When Homer was thirteen, Charles gave up the store business to seek a fortune in the California gold rush. When that failed, Charles left his family and went to Europe to raise capital for other schemes that didnt materialize. After Homers high school graduation, his father saw a newspaper advertisement, Homers apprenticeship at the age of 19 to J. H. Bufford, a Boston commercial lithographer, was a formative but treadmill experience. He worked repetitively on sheet music covers and other work for two years. By 1857, his career was underway after he turned down an offer to join the staff of Harpers Weekly. From the time I took my nose off that lithographic stone, Homer stated, I have had no master, Homers career as an illustrator lasted nearly twenty years. His quick success was due to this strong understanding of graphic design. Before moving to New York in 1859, Homer lived in Belmont and his uncles Belmont mansion, the 1853 Homer House, was the inspiration for a number of his early illustrations and paintings, including several of his 1860s croquet pictures. George Washington was an American politician and soldier who served as the first President of the United States from 1789 to 1797 and was one of the Founding Fathers of the United States. 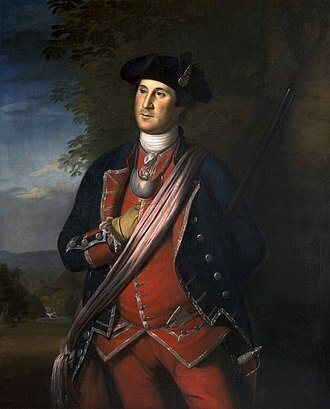 He served as Commander-in-Chief of the Continental Army during the American Revolutionary War and he is popularly considered the driving force behind the nations establishment and came to be known as the father of the country, both during his lifetime and to this day. Washington was widely admired for his leadership qualities and was unanimously elected president by the Electoral College in the first two national elections. Washingtons incumbency established many precedents still in use today, such as the system, the inaugural address. His retirement from office two terms established a tradition that lasted until 1940 when Franklin Delano Roosevelt won an unprecedented third term. The 22nd Amendment now limits the president to two elected terms and he was born into the provincial gentry of Colonial Virginia to a family of wealthy planters who owned tobacco plantations and slaves, which he inherited. In his youth, he became an officer in the colonial militia during the first stages of the French. In 1775, the Second Continental Congress commissioned him as commander-in-chief of the Continental Army in the American Revolution, in that command, Washington forced the British out of Boston in 1776 but was defeated and nearly captured that year when he lost New York City. After crossing the Delaware River in the middle of winter, he defeated the British in two battles, retook New Jersey, and restored momentum to the Patriot cause and his strategy enabled Continental forces to capture two major British armies at Saratoga in 1777 and Yorktown in 1781. 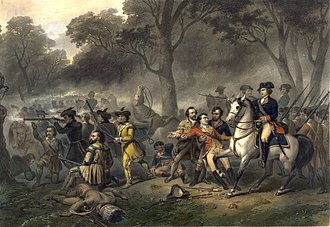 In battle, Washington was repeatedly outmaneuvered by British generals with larger armies, after victory had been finalized in 1783, Washington resigned as commander-in-chief rather than seize power, proving his opposition to dictatorship and his commitment to American republicanism. 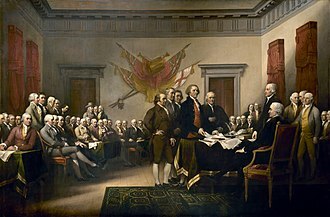 Washington presided over the Constitutional Convention in 1787, which devised a new form of government for the United States. Following his election as president in 1789, he worked to unify rival factions in the fledgling nation and he supported Alexander Hamiltons programs to satisfy all debts and state, established a permanent seat of government, implemented an effective tax system, and created a national bank. In avoiding war with Great Britain, he guaranteed a decade of peace and profitable trade by securing the Jay Treaty in 1795 and he remained non-partisan, never joining the Federalist Party, although he largely supported its policies. Washingtons Farewell Address was a primer on civic virtue, warning against partisanship, sectionalism. He retired from the presidency in 1797, returning to his home, upon his death, Washington was eulogized as first in war, first in peace, and first in the hearts of his countrymen by Representative Henry Lee III of Virginia. He was revered in life and in death and public polling consistently ranks him among the top three presidents in American history and he has been depicted and remembered in monuments, public works and other dedications to the present day. The Han Chinese, Han people or simply Han are an ethnic group native to East Asia. They constitute approximately 92% of the population of China, 95% of Taiwan, 76% of Singapore, 23% of Malaysia, Han Chinese are the worlds largest ethnic group with over 1.3 billion people. Similarly, the Chinese language came to be named the Han language ever since, in the Oxford Dictionary, the Han are defined as The dominant ethnic group in China. In the Encyclopedia of the Peoples of Asia and Oceania, the Han are called the dominant population in China, as well as in Taiwan, according to the Merriam-Webster Dictionary, the Han are the Chinese peoples especially as distinguished from non-Chinese elements in the population. The name Hanzhong, in turn, was derived from the Han River, which flows through the regions plains. The river, in turn, derives its name from such as Tianhan, Xinghan or Yunhan, all ancient Chinese poetic nicknames for the Milky Way. This gave rise to a commonly used nowadays by overseas Chinese for ethnic identity – Huaren. The term is used in conversation and is an element in the Cantonese word for Chinatown. The vast majority of Han Chinese – over 1.2 billion of them – live in areas under the jurisdiction of the Peoples Republic of China, where they constitute about 92% of its population. 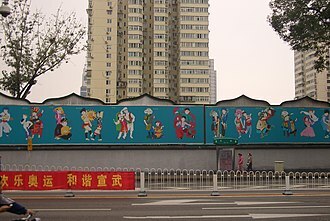 Han Chinese constitute the majority in both of the administrative regions of the PRC—about 95% and 96% of the population of Hong Kong and Macau. 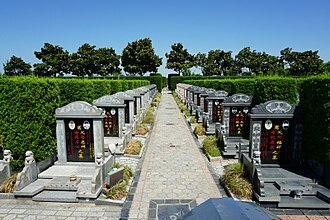 There are over 22 million Han Chinese in Taiwan, they began migrating from the coastal provinces of mainland China to Taiwan during the 13th to 17th century. At first, these migrants chose to settle in locations that bore a resemblance to the areas they had left behind in mainland China, hoklo immigrants from Quanzhou settled in coastal regions, and those from Zhangzhou tended to gather on inland plains, while the Hakka inhabited hilly areas. 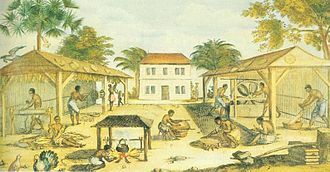 Clashes between these groups over land and cultural differences led to the relocation of some communities, of about 40 million overseas Chinese worldwide, nearly 30 million live in Southeast Asia. SMPTE color bars is a television test pattern used where the NTSC video standard is utilized, including countries in North America. 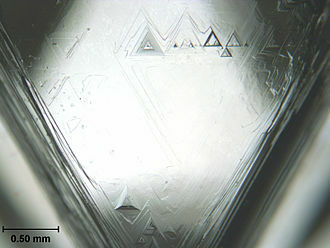 The Society of Motion Picture and Television Engineers refers to this test pattern as Engineering Guideline EG 1-1990, the components of this pattern are a known standard. The pattern is used for setting a television monitor or receiver to reproduce NTSC chrominance and luminance information correctly. The color bar test pattern was originally conceived by Norbert D. Larky of RCA Laboratories, U. S. patent 2,742,525 Color Test Pattern Generator was awarded on April 17,1956 to Norbert D. Larky and David D. Holmes. Previously categorized by SMPTE as ECR 1-1978, the development of this test pattern was awarded an Engineering Emmy in 2001-2002, the Color bar signal is generated with unconventionally slow rise and fall time value to facilitate video level control and monitor color adjustments of HDTV and SDTV equipment. In a survey of the top standards of the organizations first 100 years, in a SMPTE color bar image, the top two-thirds of the television picture contain seven vertical bars of 75% intensity. In order from left to right, the colors are white, cyan, magenta and blue. The graticule of a vectorscope is etched with boxes showing the regions where the traces from these seven bars are supposed to fall if the signal is properly adjusted. Below the main set of seven bars is a strip of blue, cyan, the bottom section of the test pattern contains a square of 100% intensity white and a rectangle of 7. 5% intensity black, for use in setting the luminance range. More modern versions of the feature a pluge pulse. The white square lines up so that it is below the green and cyan bars, on a waveform monitor this will show up with the white bar overlapping the peak of the yellow, the pluge pulse is positioned within the black rectangle, below the red bar. It comprises three vertical bars, a rightmost one with intensity 4% above black level, a middle one with intensity exactly equal to black. When a monitor is properly adjusted, the rightmost pluge bar should be just barely visible, while the two should appear indistinuishable from each other and completely black. 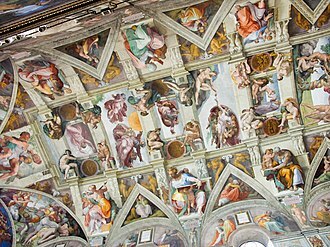 He has been variously called the father of palaeontology and architecture, and is widely considered one of the greatest painters of all time. 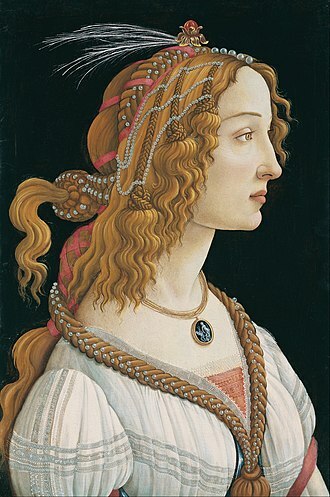 Sometimes credited with the inventions of the parachute and tank, many historians and scholars regard Leonardo as the prime exemplar of the Universal Genius or Renaissance Man, an individual of unquenchable curiosity and feverishly inventive imagination. Much of his working life was spent in the service of Ludovico il Moro in Milan. 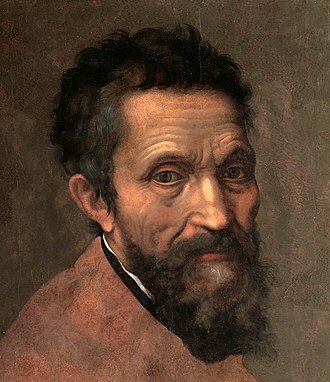 He worked in Rome and Venice, and he spent his last years in France at the home awarded to him by Francis I of France, Leonardo was, and is, renowned primarily as a painter. Among his works, the Mona Lisa is the most famous and most parodied portrait, Leonardos drawing of the Vitruvian Man is regarded as a cultural icon, being reproduced on items as varied as the euro coin, and T-shirts. 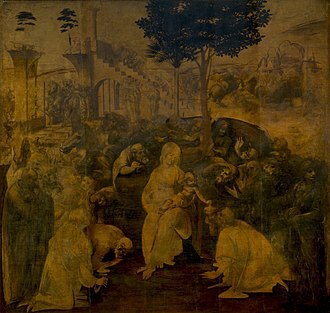 Perhaps fifteen of his paintings have survived, Leonardo is revered for his technological ingenuity. He conceptualised flying machines, a type of armoured fighting vehicle, concentrated power, an adding machine. Some of his inventions, such as an automated bobbin winder. A number of Leonardos most practical inventions are nowadays displayed as working models at the Museum of Vinci. He made substantial discoveries in anatomy, civil engineering, geology and hydrodynamics, Leonardo is widely considered one of the most diversely talented individuals ever to have lived. 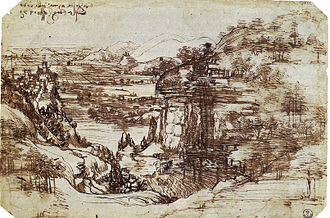 Leonardo was born on 15 April 1452 at the hour of the night in the Tuscan hill town of Vinci. 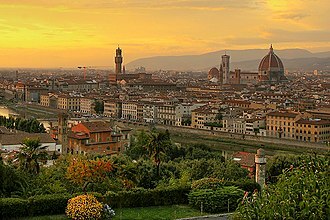 He was the son of the wealthy Messer Piero Fruosino di Antonio da Vinci, a Florentine legal notary, and Caterina. Leonardo had no surname in the modern sense – da Vinci simply meaning of Vinci, his birth name was Lionardo di ser Piero da Vinci, meaning Leonardo. The inclusion of the title ser indicated that Leonardos father was a gentleman, little is known about Leonardos early life. 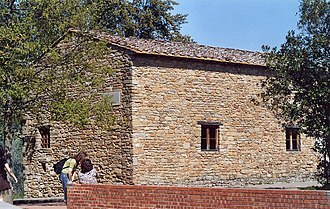 He spent his first five years in the hamlet of Anchiano in the home of his mother and his father had married a sixteen-year-old girl named Albiera Amadori, who loved Leonardo but died young in 1465 without children. Rembrandt Harmenszoon van Rijn was a Dutch draughtsman and printmaker. A prolific and versatile master across three media, he is considered one of the greatest visual artists in the history of art. Having achieved youthful success as a painter, Rembrandts years were marked by personal tragedy. Yet his etchings and paintings were popular throughout his lifetime, his reputation as an artist remained high, Rembrandts portraits of his contemporaries, self-portraits and illustrations of scenes from the Bible are regarded as his greatest creative triumphs. His self-portraits form a unique and intimate biography, in which the artist surveyed himself without vanity and his reputation as the greatest etcher in the history of the medium was established in his lifetime, and never questioned since. Few of his paintings left the Dutch Republic whilst he lived, but his prints were circulated throughout Europe, because of his empathy for the human condition, he has been called one of the great prophets of civilization. Rembrandt Harmenszoon van Rijn was born on 15 July 1606 in Leiden, in the Dutch Republic and he was the ninth child born to Harmen Gerritszoon van Rijn and Neeltgen Willemsdochter van Zuijtbrouck. 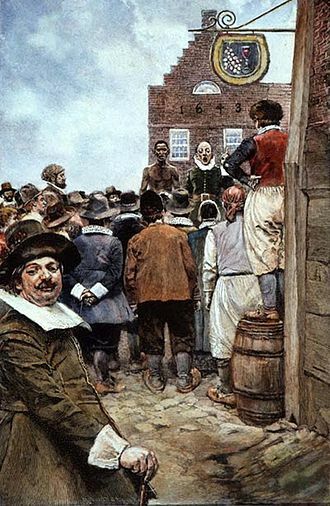 His family was quite well-to-do, his father was a miller, religion is a central theme in Rembrandts paintings and the religiously fraught period in which he lived makes his faith a matter of interest. His mother was Roman Catholic, and his father belonged to the Dutch Reformed Church, unlike many of his contemporaries who traveled to Italy as part of their artistic training, Rembrandt never left the Dutch Republic during his lifetime. He opened a studio in Leiden in 1624 or 1625, which he shared with friend, in 1627, Rembrandt began to accept students, among them Gerrit Dou in 1628. In 1629, Rembrandt was discovered by the statesman Constantijn Huygens, as a result of this connection, Prince Frederik Hendrik continued to purchase paintings from Rembrandt until 1646. He initially stayed with an art dealer, Hendrick van Uylenburgh, Saskia came from a good family, her father had been a lawyer and the burgemeester of Leeuwarden. Jan Styka was a Polish painter noted for producing large historical, battle-piece, and Christian religious panoramas. He was illustrator and poet, known as a great patriotic speaker - his speeches were printed in 1915 under the French title Lame de la Pologne. Next he came back to Lwów and opened there a workshop, together with a celebrated Polish historical painter Wojciech Kossak, they created his most famous work in Poland – The Racławice Panorama. Later he travelled to Italy for a time before moving to France where the great art movements at Montmartre and Montparnasse were taking shape. Among Stykas important works is the scene of Saint Peter preaching the Gospel in the Catacombs painted in Paris in 1902. In 1910 Styka painted a portrait of esteemed pianist and Polish statesman, Ignacy Jan Paderewski, near the end of the 19th century, Paderewski had commissioned Styka to paint what would become his most famous work internationally. Originally entitled Golgotha, the became known simply as The Crucifixion. This piece is an enormous panorama standing 195 feet long by 45 feet in height, the Crucifixion has a fascinating history. 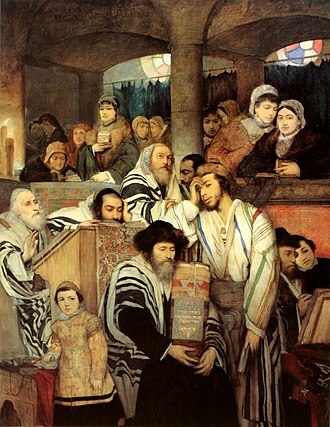 Upon its commission in 1894, Styka travelled to Jerusalem to prepare sketches, and to Rome, the painting was unveiled in Warsaw to great success on June 22,1897. 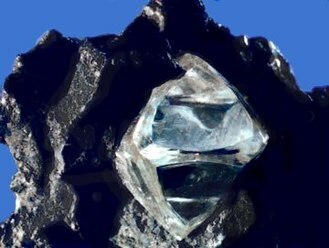 It was shown in many of the cities of Europe, before making its way to America. The painting was seized when Stykas American partners failed to pay the customs taxes, in 1944 the painting was found, rolled around a telephone pole and badly damaged, having languished in the basement of the Chicago Civic Opera Company for decades. 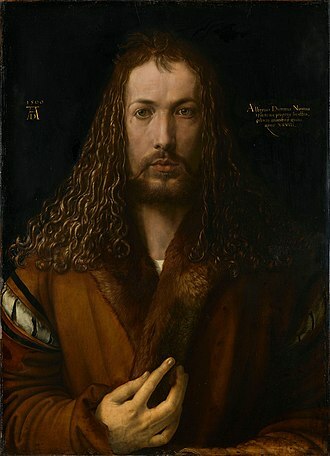 Acquired by American businessman, Hubert Eaton, the painting was restored by Jan Stykas son and it is on display in the Hall of the Crucifixion at Forest Lawn Memorial Park Cemetery in Glendale, California. In 2005–2006 the painting underwent a restoration as part of Forest Lawns centennial celebration. It currently is shown, except on Mondays, on the hour and it features a new, state of the art guided light show and narrated presentation written by biblical scholar Timothy Kirk. Avenue with linden in the cemetery by Ringkøbing, Jutland, Denmark. "Nur für deutsche Fahrgäste" ("Only for German passengers") on the tram number 8 in German-occupied Kraków, Poland. 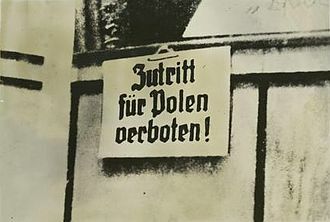 German warning in occupied Poland 1939 – "No entrance for Poles!" An African-American youth at a segregated drinking fountain in Halifax, North Carolina, in 1938. Égalité devant la mort (Equality Before Death), 1848, oil on canvas, 141 × 269 cm (55.5 × 105.9 in), Musée d'Orsay, Paris. 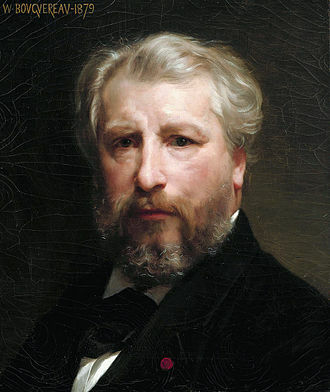 Equality is Bouguereau's first major painting, produced after two years at the École des Beaux-Arts de Paris at the age of 23. An ad asking automakers to place ads in Hearst chain, noting their circulation. 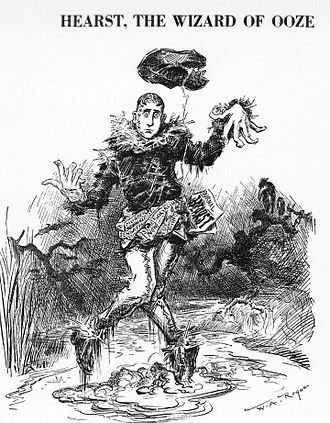 Cartoonist Rogers in 1906 sees the political uses of Oz: he depicts Hearst as the Scarecrow stuck in his own oozy mud in Harper's Weekly. Puck magazine published this cartoon in its edition of October 31, 1906. Seen as supporting "Hoist" in his bid for governor are Happy Hooligan, Foxy Grandpa, Alphonse and Gaston, Buster Brown, The Katzenjammer Kids, and Maud the mule. All of these comic strips ran in newspapers owned by Hearst. All fifteen standing moai at Ahu Tongariki. David, modelling of the marble. A replica of David now stands outside the Palazzo Vecchio. Scheveningen village, a small section of the Panorama Mesdag (1880–1881), with false terrain in the foreground.